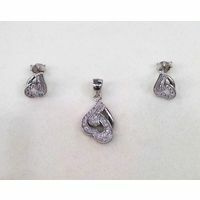 Enrich your jewellery collection by adding this pretty pendant set studded with heart shape white zircon. 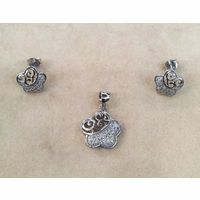 The elegant design and sophisticated look of this pendant set will surely take everyone by surprise. 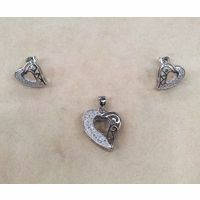 This pendant set can be worn by women of any age group as it is brilliantly designed to suit everyones style, made in 92.5 silver. 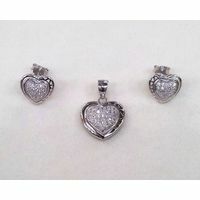 Enrich your jewellery collection by adding this pretty pendant set studded with heart shape white zircon. 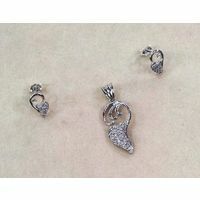 The elegant design and sophisticated look of this pendant set will surely take everyone by surprise. 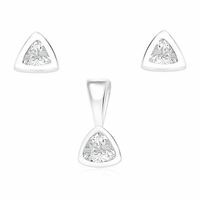 This pendant set can be worn by women of any age group as it is brilliantly designed to suit everyones style, made in 92.5 silver. Why Buy From Us ? 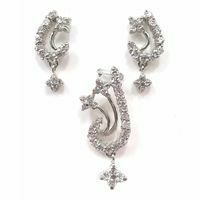 Mesmerising Designs Our wide range of Earrings, Pendants, Rings, Mangalsutra, Nose Pins, Anklets and Toe Rings ensures that you get complimented each time you adore them! 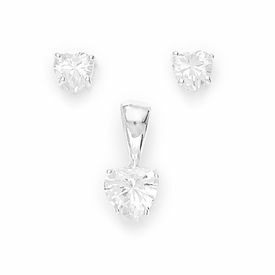 Whether you chose from silver or diamond, our designs blends greatly with any sort of occasion that would render an exceptional look and feel to you.Fit In With Us ! Not only do we take utmost care of the jewellery designs in trend but also pay attention to restoration of traditional significance of jewellery.Perfection is what we deliver and you must expect! Transparancy To Cherish We provide you with what you see. All our products go through several quality checks before reaching your door. Our happy customers are a certification to our transparency and a motivation for our progressive vision. Certified Assurance The value of a precious stone is determined by its gemological makeup, natural rarity and finished quality. A Certificate clearly discloses the details of any item it accompanies, providing confidence for both buyer and seller.It is the result of continuous research, support and synergy with professionals and consumers alike that European Gemological Laboratory certified us and showcased confidence in us.Convenience Guaranteed Comfort is your right and our promise. We go out of our way to ensure every question of yours is answered to satisfaction. We are always happy to assist you through all stages of our relationship with you.We aim at making your shopping experience memorable with our easy to navigate and user friendly website. Not only this, progress towards betterment is our key. Price Is What We Excel At : Affordable price is our Unique Selling Proposition (USP)! We deliver the best that anyone can at prices that no one else can. 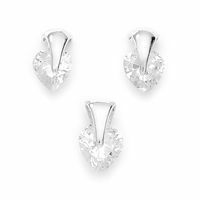 Affordability is what differentiates us from our competitors and makes us stand out of the crowd of online jewellery brands.